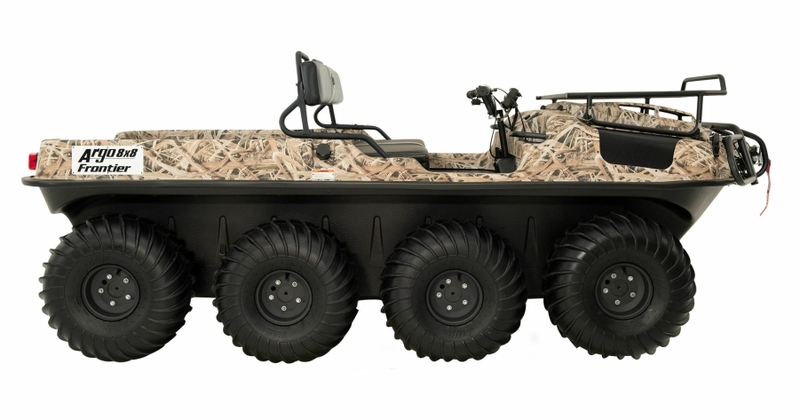 The Argo Frontier 750 Scout 8x8 is based off the Frontier 700 8x8 chassis but has an upgraded 26hp EFI engine and is designed to meet the most demanding needs of the avid hunter and outdoorsman who are on a budget but want all the popular accessories to get them out into the field. 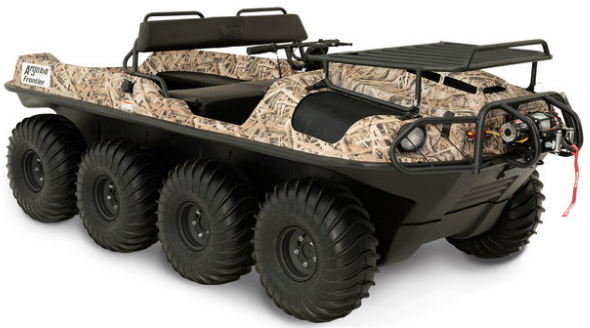 The Scout 8x8 is packed with standard accessories, such as front gear rack, skid plate, front and rear bearing extensions, Warn Provantage 3500 cable winch, brushguard, bilge pump, and rear brake lights. It utilizes the Generation II Classic skid steer transmission which is available in both standard and optional 3.3 low gear ratios. 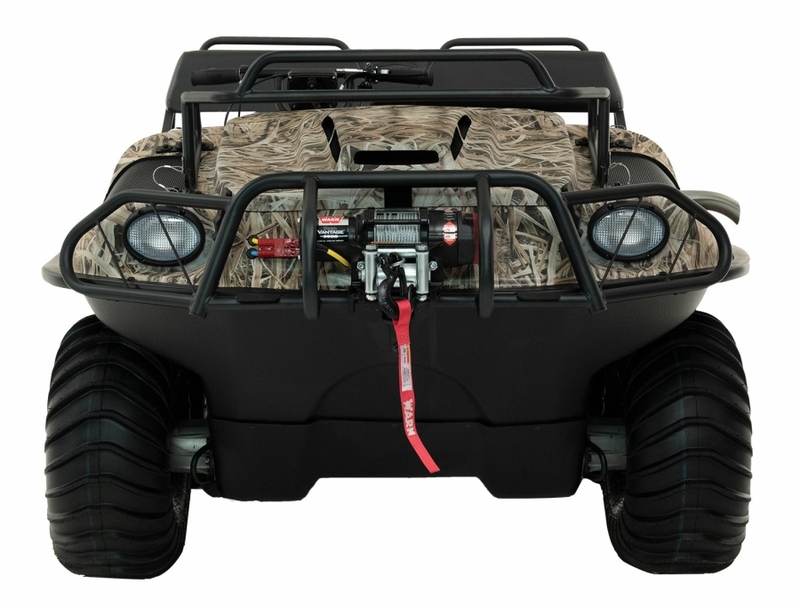 Standard power comes from the reliable upgraded Kohler Command Pro 26hp engine which provides the perfect amount of horsepower for those looking to go explore the nastiest bogs yet has ample power for those adding tracks in deep mud environments. It has a load capacity on the land of 775 lbs / 343 kg. and a water load capacity of 655 lbs / 297 kg. 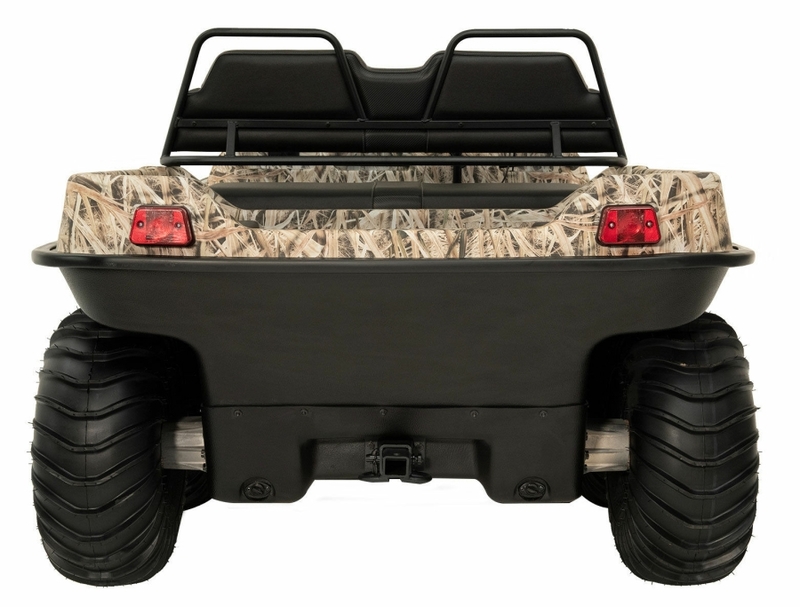 Argo designed 24” (610 mm) mud and swim tires mounted on steel offset black rims combine to give this machine great traction and best in class payload all while providing a water speed of 3.0 mph. The Frontier 750 Scout 8x8 is powered by a 4 stroke OHV V-Twin air cooled 747cc 26 hp (19.8 kW) Kohler Command Pro EFI engine. It has a load capacity of up to 900 lb. / 410 kg on land or 800 lb. / 360 kg on water and can transport up to 6 passengers on land. It features a towing capacity of 1,400 lb. / 635 kg. The front rack capacity is 50 lb. / 22.7kg. Available colors are Shadow Grass or Break-Up Camo. • Innovative Argo planetary differential transmission with High/Low Forward, Neutral and Reverse. • Low emissions with EPA and available CARB Certifications.